The supermarket was well stocked this week with fresh green beans. The side of the display had jars of gourmet fried onions — another postmodern reimagining of a boomer classic. In keeping with the holiday tradition of assigning a writer to write about the current holiday's traditions, time.com informs us that the association is an accident: the dish was invented in 1955 by Campbell's Soup and just happened to be in an AP feature. A quick check of the Google News Archive finds that it was served with barbeque to the Shah of Iran and Empress Soraya that year in Florida. Since that visit was in January, it must have actually been invented at the start of the year and under other circumstances might have ended up a Nowruz standard. A slightly fancier version in Sylvia Lovegren's entertaining Fashionable Food: Seven Decades of Food Fads, adding sliced almonds, is from a 1961 Campbell's ad. I am not much of one for holidays: I use the quiet time to catch up on work. In my experience, Thanksgiving is the hardest day to find a restaurant open (and serving a regular menu). On Christmas, there is Halal or Kosher (when it isn't Saturday), or one can eat Chinese food with all the Jewish people. As it happens, our two favorite green bean dishes are Chinese. My favorite Chinese restaurant in Boston area, best sweet and sour in Boston area [ES-5/77]. Favorites are ginger and fish meat. Best vermicelli (bean thread) dishes in Boston [GLS-78]. We also called them Fu-yi Green Beans, and that is what we still call the dish at home, where we like to make it with the jars of fermented bean curd that have chili added. It's possible that was the name on the menu, or something someone in our party knew from elsewhere. If so, the name in Cantonese would be something like 腐乳豆角 fu6 jyu5 dau6 gok3 as here. But memory is a tricky thing, and I would welcome corrections from Bostonians who might have saved a menu from back then. Due to changing demographics in Chinatown, I have not seen this dish around in some time, but perhaps I have just missed it. William Shurtleff, America's soy food evangelist, has a page on the history of fermented bean curd. You had to go across the river to Cambridge to get Kan Shao Green Beans at Joyce Chen's Small Eating Place (I have menus here from the larger place near Fresh Pond). Regular green beans are 四季豆 si4 ji4 dou4, 'four seasons beans', because they are available year round. Strictly speaking, there are two related ways of cooking possible, and at least in America, restaurants are not always careful to distinguish them. Mandarin 乾燒 (simplified 干烧) gan1 shao1 / Cantonese 乾炒 gon1 caau2 is ordinary dry-cooked. 乾煸 gan1 bian3 involves first deep frying the food and then dry-frying it a second time with less oil. This produces Szechwan-style shriveled green beans. They are traditionally made with pork and/or dried shrimp, but those can be left out to make it vegan. This is where the nostalgia becomes relevant to this blog. 乾 has an ordinary simplified form 干. But what of 煸, a character only used in a regional style of cooking? Most printed menus here substitute just the phonetic bian part, 扁. (The full character has the fire radical ⽕, as expected of a cooking word.) I believe that is a limitation of the technology, that that is all that is available to the printer. (Though I would welcome suggestions of other reasons I may have overlooked.) 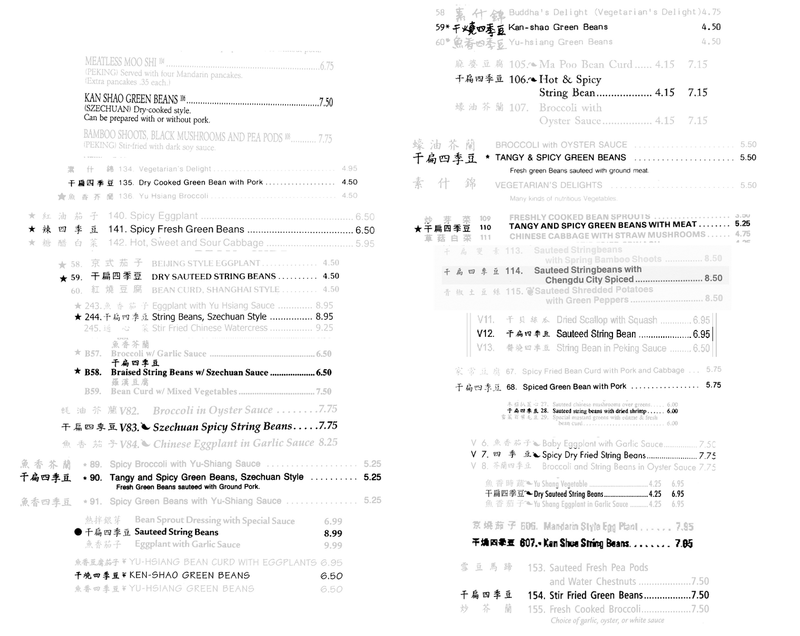 In the case of Sichuan Garden in Brookline Village, the online menu has 干煸四季豆, but the printed one has 干扁四季豆. Of course, it's not like the more complicated character was unknown here. The Good Food of Szechwan (1974; printed in Japan) has (p. 95) Gan-bian Si-ji-dou 乾煸四季豆 Dry-fried String Beans. 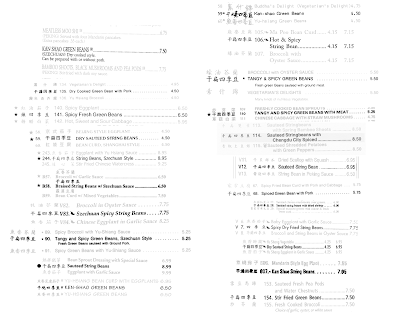 In some ways, the Reading Chinese Menus entries at the Adventures with Kake blog are like this century's version of The Eater's Guide to Chinese Characters: more personal, more interactive, and always a work in progress. She has an post there on 乾煸四季豆 — gān biān sì jì dòu — dry-fried green beans. In English, haricots verts are longer, thinner green beans that are tender enough to be eaten without breaking off the ends. A recipe in Red Hot and Green for “poached tofu and green beans with wasabi glaze” (p. 85) makes use of this to spear the tofu with the green beans. We've found this dish to be a good choice for pot lucks. The etymology of haricot is uncertain, with contenders from three different continents. Haricot is a pair of homonyms: haricot de mouton is a lamb stew, from a verb harigoter meaning to cut into small pieces. The Ménagier de Paris (ca. 1393) has Hericot de mouton (II, 148). François Génin derives (Récréations philologiques, I. p. 50) this haricot from Latin aliquot 'a few' and Littré (s.v.) quotes the Comtesse de Bassanville as proposing Arabic hali-gote (I'm not sure what this is). More sensible sources derive harigoter from Old Low Franconian *hariôn 'to mess up', related to the English verb harry. The idea that haricot beans are so-called because they came to be used in haricot stew is a bit far-fetched, particularly since beans do not seem to be a common ingredient. Even more so is Alexandre Dumas (père) 's claim that the stew originally was meat and beans, until “l'un des deux ingrédients a été détrôné par les navets” 'one of the ingredients was dethroned by turnips' (Grand dictionnaire de cuisine, s.v.). More likely is that the form of the earlier stew word influenced the later bean word. Small beans, haricot beans, or Calicut beans, or even Rottes beans are of two kinds: the white and the colored, among them there are also some white ones, but smaller and rounder, which are not the big white ones. The problems with കോഴിക്കോട് are that substantial amounts of beans did not come to Europe from India and that the haricot form occurs a couple decades before. The h appears in 1640, in Jacques Bouton's Relation de l'establissement des François depuis l'an 1635 en l'isle de la Martinique, “que quelque-vns appellent pois de Rome, autres des feſoles, autres haricots” 'which some call Roman peas, others fasels, others haricot' (p. 50). And in Antoine Oudin's French-Italian dictionary, Recherches italiennes et françoises, “Haricot, febves de haricot, faggiuoli” (p. 293). Likewise in his 1645 French-Spanish Tresor des deux langues espagnolle et françoise, “Haricot, febves de haricot, faſeoles.” (earlier edition in Google Books; later edition in Gallica). These works are posthumous extensions of his father César's work. Some sources, including Wikipedia, say that haricot is also in their 1640 Curiositez françoises, but I cannot find it there; perhaps it's under a different headword. Also notable is that the 1607 French-Spanish had “Faſol, legumbre, Phaſeole, vne eſpece de pois” (here) and the 1627 Thresor des trois langues, espagnole, françoise, et italienne had “Faſól, Phaſeole, vne eſpece de pois, vna ſorte de ceſi” (p. 278). Bescherelle's Dictionnaire national derived (II. p. 103) haricot from a Celtic root har meaning seed. De Candolle's theory that haricot came from Italian araco, Latin Aracus niger, a name for the vetch Lathyrus ochrus, (French; English) did not gain any traction. Il est remarquable que le mot haricot, en mexicain, ayacotli, n'apparaît, dans la langue français, qu'aux dernières années du XVIe siècle. On disait fèves ou faseols. Si le mot de haricot nous fût venu en passant par l'Espagne, comme ouragan, maïs, savane, canot et tant d'autres, le doute ne serait guère possible. Mais on n'en trouve pas trace en espagnol. Les corsaires, flibustiers ou colons français de la Floride et du Mississippi ne l'auraient-ils pas directement introduit? Ce sont de bien vagues suppositions suggérées pas une ressemblance de mots singulière. L'étymologie de aliquot que donne Génin, dans ses Récréations philologiques, nous paraît peu plausible, appliquée au mot haricot pris dans le sens de fève. It is remarkable that the word haricot, in Mexican ayacotli, did not appear in French, until the last years of the 16th Century. One said fèves or faseols. If the word haricot had come to us through Spain, like hurricaine, maize, savannah, canoe and so many others, doubt would hardly be possible. But there is no trace of it in Spanish. Couldn't French pirates or colonists from Florida or Mississippi have introduced it directly? These are just vague suppositions suggested by a singular resemblance of the words. The etymology from aliquot which Génin gives in his Récréations philologiques (see above), hardly seems plausible to us, applied to the word haricot in the sense of bean. Mexican Spanish does in fact have ayocote for some kinds of beans, but there are no intermediate forms there and certainly not on the Continent. This is the main problem: new words do not get introduced in place of existing ones with no evidence at all by lone pirates. A number of later sources get the story of Heredia's discovery though a piece by the entomologist Jean Henri Fabre on the bean weevil: “Le Bruche des Haricots” / “An Invader — the Haricot-weevil.” Fabre relates how a neighbor lent him a copy of the Noël of the Annales politiques et littéraires for 1901, titled Les Enfants jugés par leurs pères, where there is a conversation between “the master-sonneteer and a lady journalist,” which Fabre then quotes extensively. Gallica does not have the Christmas numbers of this journal, and I have not found it elsewhere (except for sale with expensive shipping — if some reader has access to a copy, please let me know what it has), but based on the advertisements (60 centimes) in the regular numbers, I believe it was in fact 1900 and that the format of the “conversation” was letters from the Immortals in response to their correspondent Aimée Fabrègue (who had been an editor of La Fronde), the issue's complete title being, “Les Enfants jugés par leurs pères ou en autres termes, Les Académiciens jugés par eux-mêmes.” So I am not entirely certain of the details, but will assume Fabre has the gist of it. Heredia says that he found ayacot while studying the beautiful 16th century natural history book, Hernandez's De Historia plantarum novi orbis. As has come up here before, the surviving work and translations of Francisco Hernández are a mess. But I believe the book in question is De Historia Plantarum Novae Hispaniae. This does not mention ayacot(li) directly, but does have a chapter (II. lv.) on ayecocimatl < ayeco(tli) + cimatl, an edible root of a bean plant, which also mentions etl, the general word for 'bean'. Since the very next chapter is on the edible root cimatl, it would not be hard to work out that ayaco(t) was the bean part and without the -tli, the resemblance is even more evident. Heredia then tells how at a party of Gaston Paris's he met a savant who only knew him as the solver of the haricot etymology, and not as a poet. Gaston Paris had indeed championed Heredia's idea, citing his 1879 note in a footnote to a paper the following year on Mauritian Creole, “Si, comme il est fort probable, haricot est le mexicain ayacotli …, le créole a conservé la bonne prononciation.” 'If, as is very probably, haricot is the Mexican ayacotli, Creole has preserved the right pronunciation.' (Romania, IX. p. 575). In 1880, a French translation of Sahagún was published, and where he mentioned ayecotli (xxi. p. 36), Remi Simeon added a footnote (p. 44) giving the variant ayacotli, the Spanish ayacote, the general word etl, and exotl for haricot vert, but did not propose any direct relationship. Eugène Rolland, in 1903, before proposing his own hybrid of two older theories, namely, “Cette fève se mange souvent avec le haricot de mouton …; on a donc transformé fève de calicot en fève de haricot par fausse étymol. pop.” 'This bean is often eaten with haricot de mouton, so that Calicut bean is transformed into haricot bean by folk etymology' (Flore populaire, IV. p. 160), notes (indirectly) a 1897 paper by Bonnet claiming that haricot comes from Mexican ayacotl. In fact, that paper, about the question of beans in the Old World before the discovery of the New, says, “Je ne dirai rien de l'étymologie du mot Haricot sur laquelle on a tant discuté” 'I will not say anything about the etymology of haricot, about which there has been so much discussion'. I don't know the stand of more modern specialized works (and would welcome pointers). The OED still has “Origin uncertain: see Littré,” while we wait for them to make their way around to the H's. The Oxford dictionary of English Etymology has “perh. – Aztec ayacotli.” The Petits Robert and Larousse stick with French harigoter. French Wikipedia, s.v. Haricot and Phaseolus, is somewhat uncommitted, listing some of the alternatives given above. As an employee of Bloggingbooks (bloggingbooks.net), I am looking for enthralling, informative and clearly legible blogs, and I discovered yours. Bloggingbooks publishing house, which is a trademark of the scientific publishing house known as SVH Verlag, is actively looking for new authors. Would you be interested in publishing your blog posts in book format? I would be pleased to discuss the publication possibilities that are offered by Bloggingbooks. You will find basic information about Bloggingbooks concept by visiting our homepage: bloggingbooks.net. Of course, I would be pleased to provide you more information and to answer your queries by e-mail.